Norwalk Superintendent of Schools Steven Adamowski, right, and Gov. 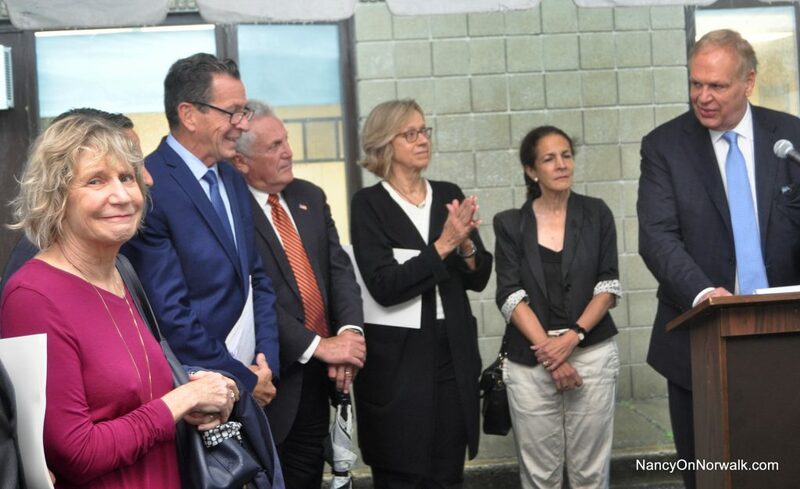 Dannel Malloy, second from left, mark the opening of the Norwalk Center for Specialized Learning in Literacy on Sep. 25. The Norwalk media regularly covers Board of Education meetings. That enables the public to develop a general grasp of what’s going on in our schools. In contrast, our media does not often cover committee meetings of the board, where much of the nitty-gritty work on program development is accomplished. In most cases, by the time an item reaches the full board for a vote, detailed discussions have already been completed at the committee level, sometimes over many months. But something else happens at the committee level; something the public rarely reads or hears about: The monitoring and evaluation of already-adopted initiatives. This is an important component of the work of any organization but is critical for those that rely on taxpayer support. Long-term funding of programs that are not producing desired results is a waste of public funds and should be discontinued. The board has five committees that meet monthly: personnel/negotiations, facilities, policy, finance, and curriculum/instruction. There is also a taskforce on special education that meets monthly. We, the members of the curriculum and instruction committee, plan to provide residents regular updates of our committee work. Expanded high school curriculum: Over the last three years, the board increased our high school graduation requirement from the state minimum of 20 credits to the state recommended 26 credits, which required hiring 20 additional teachers. This also required additional counseling for high school students to ensure they adjust to the new workloads. Despite some early issues, such as the need to inform students earlier about their schedules, the expanded curriculum will provide students access to additional courses related to their interests and will undoubtedly raise SAT and ACT scores. New Gifted and Talented Program: The board spent the better part of last year devising a rigorous and more inclusive gifted and talented program; a program aimed at enriching the education of all children. It is being piloted this year at Tracey, Cranbury and Roton, and we plan to expand it in the coming years. The board also approved a more inclusive gifted and talented identification process. The goal is to ensure all students receive rigorous and imaginative instruction all day, every day. From what we’ve heard from parents and staff, the new program is working well. New Science Program: Science instruction across the state, including Norwalk, has been catch-as-catch-can for years, primarily because the state and federal governments did not test students in science. That has changed. And so has Norwalk: Last year, we began working with a consortium of schools and non-profits to train staff and implement a new science curriculum developed by Lawrence Hall of UC Berkeley. The staff development has moved ahead despite a glitch at one of our middle schools; new science modules are being used as they arrive. It’s too early to evaluate, so we’ll monitor this initiative every few months. World Languages: This is a new initiative, with a two-fold aim: evaluate our existing language program and possibly expand the number of languages offered in our schools, from elementary to high school. Our primary concern at the September meeting was to set up a task force to investigate these aims and to report back to the committee. The meeting benefited from having several of our language teachers discuss the strengths and weaknesses of our existing program. Next Meeting: At our October meeting, we plan to discuss the most recent gifted and talented data to see if the new identification process has produced a more diversified student population in the program. We also plan to begin reviewing the final phase of our middle school redesign program, as well as aspects of the district’s literacy instruction. Of course, the public is welcome to attend our meetings, which take place in City Hall at 5:30 p.m. on the third Tuesday of the month. Malloy and Adamowski are pretty tight. I think I recall Danny doing all sorts of “favors” for Adamowski over the years. Norwalk made a huge mistake hiring him. It would be really helpful to note if qualitative data are collected and what type. Having discussions with people who are directly involved in programs is a good start. Perhaps a confidential survey with semi-structured questions for teachers, parents, and other appropriate stakeholders would shed light on something besides test score results. SurveyMonkey has the capability to make responses confidential and will analyze the data as well. Plus, it is free.